Why Do We Say “Cup of Joe”? – Everyone has heard of a cup of Joe, but who knows where that phrase came from? Who is this legendary Joe? Why Is 1000 Called A Grand? – According to Word Detective, the use of “grand” in reference to money dates back to around 1915. It came from American underworld slang, as in a grand sum of money. What Are Nooks and Crannies? – Have you ever searched all around your house looking for something? Perhaps you lost your keys or your wallet. Did you turn over the entire house? Did you look in every nook and cranny? Now you can learn what those are. How To Pronounce GIF? – WARNING: This post is going to expose how non-tech savvy I am. If you want to continue to picture me as someone who is smart and knows a lot about technology, you might want to stop reading. Something To Know If You Can’t Get Your Dream Job – Let’s learn a lesson from one of the top basketball coaches in the country. What the one coin loophole is – In this world where bigger is better, it is important to be reminded that even the smallest actions have meaning. Another Example Of Great Writing – This comes from an awesome book about building resilience. What one NBA player gave up to win a championship – Spoiler alert…it is drugs. Now, do you want to read the post? One more thing about the post above – Find out what is even harder than giving up drugs. Why We Need to Relax Like Roger Federer – This post combines two of my favorite things. 5 Good Things – Read this if you need a pick-me-up. 5 Things We Can Learn From Seat Belts – The great thing about learning is that it is not confined to certain times or locations. Learning can happen anytime, anywhere. I like to highlight this fact by, once a month, looking at things we encounter on a daily basis and seeing what important lesson we can from them. If there are two things I am a big fan of they are Roger Federer and sleep. This Wall Street Journal article has combined both of those to make a very important point. Often, we think that if we want to be successful we must go-go-go. And while there is nothing wrong with working hard, this article uses the example of Federer to remind us that we shouldn’t forget about rest. The importance of rest is well known among top athletes and teams. But what about the rest of us who can’t run fast or jump high? Gay says that time off is good for us too. If you are interested in why you may want to talk to your boss about allowing you to take some time for rest, click here to read the entire article. WARNING: This post is going to expose how non-tech savvy I am. If you want to continue to picture me as someone who is smart and knows a lot about technology, you might want to stop reading. Have you ever seen a GIF? Maybe you didn’t know it was called a gif, but I am sure you’ve seen one. Perhaps it was on the internet. It is one of those moving picture thingys. No, not like a Casablanca. It is like an image that moves? No, not like the portraits of dead people in Harry Potter. Jif, like the peanut butter. Why, you ask. Because that is what Steve Wilhite, the person responsible for creating Graphics Interchange Format, or GIFs, while working for Compuserve in 1987, says. Yesterday I wrote about former NBA player Stephen Jackson’s decision that ultimately won him a championship. If you have not read it, you can do so here. After I wrote the post I started thinking. It is great to make a sacrifice to help you achieve a goal. That is difficult. But the next step can be even more difficult. Let’s again use the example of Stephen Jackson. He gave up smoking weed during the season and it brought him a title. Guess what he didn’t do again during the remaining 10 years of his NBA career? If you guessed gave up smoking weed during the season you are right, too. Jackson admitted he didn’t always give up weed during the season, which is why it is no surprise that he didn’t last more than two seasons in San Antonio and never won another title. I am not critiquing Jackson here. He had a very successful NBA career. He played for 13 seasons and made over $68 million dollars. My point is that it can be difficult to stick with our sacrifices. Most of us can only last so long. We do great passing up the extra slice of pizza in the midst of our weight loss challenge, only to find ourselves scarfing down the pepperonis and packing the pounds back on months later. Sacrificing something is hard. Sticking with it is way harder. Don’t believe me? Just ask Stephen Jackson. He is probably very happy with how his NBA career played out, but who knows, if he would have given up weed his entire career maybe he would have stuck with the Spurs longer and won another title or two. Sometimes we are required to give up something we really enjoy doing if it is getting in the way of a goal. If we are trying to pay off debt, we will need to give up expensive vacations. If we are trying to lose weight, we are going to have to give up cheesecake. And if we are trying to win an NBA championship, then we may just have to give up drugs. Last week, I read an article about former NBA player Stephen Jackson. In the article it mentioned a story Jackson told to ESPN about the time he had a chance to play for the San Antonio Spurs following his rookie season. The Spurs had a great team and saw Jackson as a piece that could help them bring home an NBA title. But there was one stipulation…Jackson couldn’t smoke weed during the season. So Jackson had a decision to make. He could keep smoking weed or he could play for a chance to win a championship. Seems like an easy decision right? Give up weed and win an NBA title and make millions of dollars. But there are plenty of professional basketball players who have not been able to do this. Just making sacrifices doesn’t guarantee we will be successful. Jackson didn’t win an NBA ring solely because he stopped smoking weed. Tim Duncan and Tony Parker probably had more to do with it than the drugs did. But Jackson’s decision to put the goal first is what made him successful. Our ability to make sacrifices with a greater goal in mind can make all the difference. The world is full of great writing. So I have decided I will highlight some examples whenever I stumble on them. Here’s one I came across from Adam Grant & Sheryl Sandberg’s book Option B. The book features many things that Sandberg learned after the sudden death of her husband. She learned how to find strength in the face of adversity, how to rebound from life-shattering experiences and how to help others in crisis. One of my key takeaways from reading this book is her line about strengthening the muscles around our backbone. Sandberg doesn’t mean we actually need to up our back exercises if we want to be able to bounce back from devastation. No amount of pull-ups would help us from crumpling to the floor if we found out our spouse had died. But the image she uses is one we can understand and remember. We have all heard about the importance of having a backbone. We need to stand up for ourselves and not let others walk all over us. We associate it with being strong. One way to be strong in the face of hardship is to start building our resilience now. The book uses studies done by Grant to show that our level of resilience isn’t fixed. It is something we can grow. What a great way to show this by using something we all associate with being strong (a backbone) and painting a picture of how we can add to that backbone (building up the muscles around it). A great line in an awesome book. I highly recommend you check it out. What Are Nooks and Crannies? Have you ever searched all around your house looking for something? Perhaps you lost your keys or your wallet. Did you turn over the entire house? Did you look in every nook and cranny? Does your house even have a nook? And a cranny? Wow. 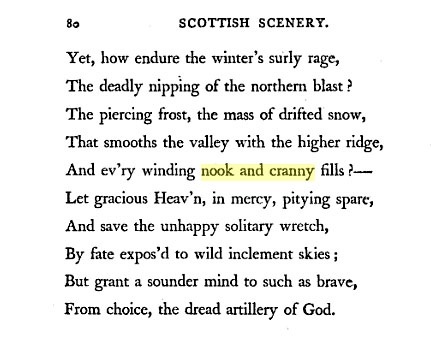 Nooks and crannies are old. Especially nooks. Nook, which refer to “an out-of-the-way corner” have been round since the mid-1300s. Crannies aren’t quite as old, but the word, which has meant “a crack or crevice” date back to around 1440. So how did two things that didn’t grow up in the same era end up together (that is known as the Catherine Zeta-Jones / Michael Douglas question)? We have a man by the name of James Cririe to thank for that. Do little actions add up? Do the small things we chose to do, or not do, even make a difference? Erasmus seemed to think that little things add up. And so does author Gretchen Rubin. Rubin uses the lesson from The Praise of Folly to explain what she calls the One Coin Loophole. “Often, when we consider our actions, it’s clear that any one instance of an action is almost meaningless, yet at the same time, a sum of those actions is very meaningful,” says Rubin. Skimping on your diet for one day may not seem like much. Just as one coin may not seem like the difference between rich and poor. But say you skimp on your diet one day a month. At the end of the year you ignored your diet for nearly two weeks worth of days. At the same time, the One Coin Loophole can be positive. It may not seem like writing once a week for an hour could be that beneficial. After all, it is such a small chunk of time, what difference could it make, right? Not so fast. After a year of following that little pattern, you’ve written for 52 hours. That feels like a much bigger chunk of time, doesn’t it? As Rubin points out, for good or bad, the sum of our actions add up. In this world where bigger is better, it is important to be reminded that even the smallest actions have meaning. The great thing about learning is that it is not confined to certain times or locations. Learning can happen anytime, anywhere. I like to highlight this fact by, once a month, looking at things we encounter on a daily basis and seeing what important lesson we can from them. The very first car was invented in 1886. The first car crash was reported to have taken place in 1891. You’d think seat belts would have come shortly after. You’d be wrong. It wasn’t until 1955 that a patent was submitted for an automotive seat belt. And it wasn’t until 1968 that it became a law at required all vehicles (except buses) to be fitted with seat belts. We put humans into outer space before we required cars to have seat belts. And it wasn’t like the delay was because the problem was new. Car accidents had been happening for 77 years. Sometime it just takes a little longer than we may think to come up with a good idea. Seat belts save lives. Research has found they are 50% effective at preventing fatal injuries for drivers. If we don’t want to die, it makes total sense that we would wear seat belts. Yet some people still do not wear them. According to the National Highway Safety Administration, 88.5 percent of drivers and front seat riders buckle up. While that is a high percentage, that still leaves 11.5 percent that apparently do not want to be safe. I guess that is a good reminder that no matter how good your product is, you just can’t convince everyone to use it. If I haven’t thrown enough facts at you, here’s another one…children are likely to be buckled 92% of the time when adults in the car use seat belts, as opposed to 72% of the time when adults are not using them. Even when we think they aren’t watching, we are influencing our kids. I guess we should make sure we are doing the right thing. I’ve never really understood how a seat belt gets so twisted. It is in the same place every time I use it, but somehow it gets tangled up from time to time. Unless you make Twizzlers, this is not something you want to happen to your product.